Two llamas that broke free from their handlers in Arizona mesmerized America and the news world on Thursday as they led people on a low-speed chase before finally being captured. The llamas escaped from a retirement community in Phoenix, Arizona, where they had been brought for the day as part of a mobile petting zoo to provide animal therapy to the residents. One of the residents is a former llama rancher. Leaving the facility for a break, the two llamas broke free and, for an hour, made news headlines around the country as users tracked their movements on Twitter and helicopters watched them from the air. The drama started when a large white llama and its slightly smaller black companion were spotted Thursday roaming in the northwestern suburb of Sun City. 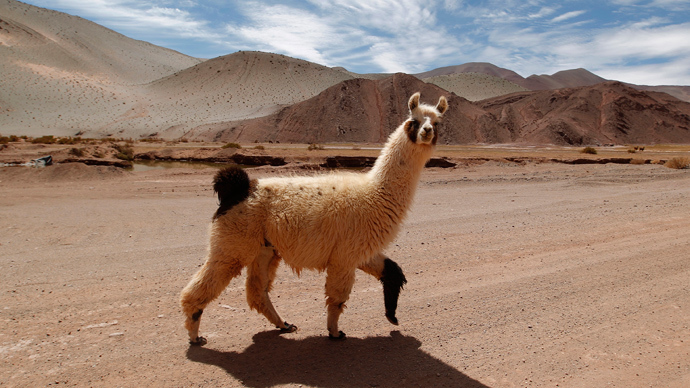 The twitter universe blew up with memes, as hastags like #llamawatch and #llamadrama began trending. Eventually, the white llama was lassoed from the back of a pick-up. “@waynefullam: Best chase since OJ's white bronco. #LlamaWatchpic.twitter.com/uz3MDNmxq5” Ain't that the truth! The Maricopa County Sheriff's Office said no criminal charges would be filed.